Eddie Jones has the necessary skills to make England an outstanding side, says former Wales captain Michael Owen. The Rugby Football Union (RFU) have confirmed the 55-year-old Australian will succeed Stuart Lancaster as head coach. Owen, who played under Jones at Saracens, says his former coach is a good choice. "He'll demand certain things from the RFU and from the players," Owen said. "Some people will thrive under him and some people won't but he won't be afraid to make those tough decisions." Lancaster's three-and-a-half-year tenure ended after England's failed World Cup campaign, which included defeats by Wales and Australia. He had only joined the Super Rugby side in September after leading Japan in the World Cup and masterminding a famous 34-32 win over South Africa. Owen, Wales' 2005 Grand Slam-winning captain, joined Saracens from Newport Gwent Dragons in 2008. "I found him to be a real top-class operator," Owen told BBC Radio Wales' Good Morning Wales. 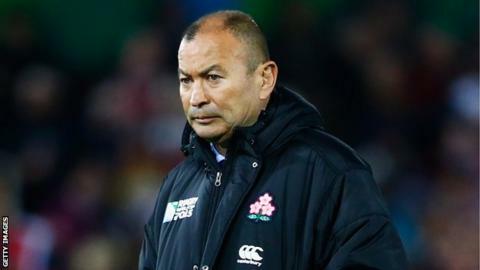 "The expectations are very high but England have been a good side and someone like Eddie Jones will come in and they will certainly stay at the same level or get better."